i decided to skip out on an etsy shop for now ... if all else fails, i'll open up an etsy shop. but, for now, im just going to keep it simple like this. please feel free to check out my 'store' - - im new to selling items so please bear with me~ i'll also be adding a 'store' icon to the side of my blog as soon as i can, there is also a link to the store at the very bottom of my blog. 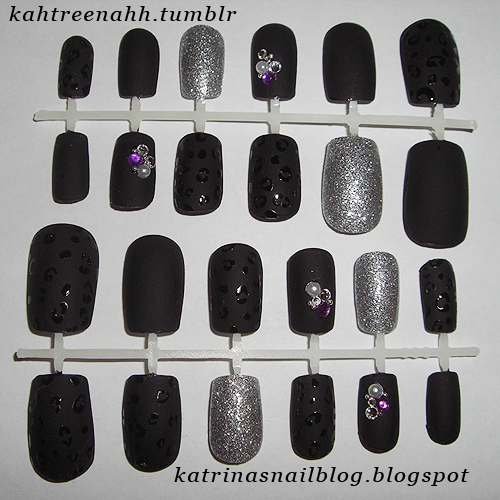 a set of 24 in Black Matte Leopard Print with Stones + 1 nail glue + $5 for shipping = $20. wow you're ideas are so great! in my blog I posted some of you're pictures. I were happy, if you visit my blog. Oh these are really pretty, I think you'll do really well with them.